No water is naturally pure. In nature, all water contains some impurities. As water flows in streams, sits in lakes, and filters through layers of soil and rock in the ground, it dissolves and absorbs the substances it touches. Some of these substances are harmless, but even naturally occurring minerals are considered contaminates at certain levels, as the water may be unpalatable or even unsafe. The majority of substances that are absorbed into water from natural rock or soil conditions are harmless. However, once humans have introduced contaminants into the soil or streams from factories, farmlands, or even by people in their homes or yards, the water supplies may be contaminated with any number of chemicals or toxic substances. The federal Safe Drinking Water Act of 1974 is the primary federal law protecting drinking water supplied by public water systems (those servicing more than 25 people). Under the law, the U. S. Environmental Protection Agency (EPA) is the federal agency responsible for setting national standards for drinking water. The national standards established by the EPA are required to be enforced by the states. The drinking water standards are intended to address drinking water at two levels. The first level relates to public health. The regulations in this area relate to the maximum contaminant level for more than 80 contaminants that may occur in drinking water that pose a risk to human health. When it is economically or technologically not feasible to lower a maximum contaminant level relating to a specific contaminant, then prescribed treatment techniques are required to prevent adverse health affects of the contaminant on humans. The second level of regulations relates to taste, odor, and appearance of the drinking water. SDWA also has many new provisions that help states and water supply systems to improve the quality of drinking water by preventing problems before they occur. It has become clear that the best way to protect the nation's water supply is to protect the water at its source. For example, the act requires that each state develop a program to identify contamination threats and determine the resulting susceptibility of the drinking water sources such as watersheds, ground water, or reservoirs to activities that may harm the source water. Once the contamination source is identified, the state must then develop a program to address that contamination source and its prevention from entering the water supply. Protozoa and viruses - Common examples of protozoa contaminants are giardia and cryptosporidium. Nitrates - Agricultural activities which use fertilizers or generate manure contain high levels of nitrogen and phosphorous. These substances often leach into the water supply through water runoff. Stomach and liver cancer along with reproductive problems are often linked to nitrate contamination. Volatile Organic Compounds - Examples of these compounds are industrial solvents, dry-cleaning solvents, benzene, gasoline, paints, and etc. Lead and copper - These metals usually are introduced into the potable water supply as a result of water being carried through pipes containing lead or lead solder and water coming in contact with brass faucets. Even in small amounts, lead in the water supply can be a problem, especially in small children. Lead may accumulate in the body over time and eventually reach unsafe health levels. Pesticides - This group of contaminants may be fungicides, insecticides, and herbicides. Land application of pesticides may eventually leach into the water supply. This is particularly a problem in areas relying upon well water. Radon - Houses relying upon well water are more subject to exposure to radon from the water supply than houses relying upon public water supply systems. As water passes through the shower head or other water release points, the radon present in the water is released into the air. Fortunately, in most cases, radon released into the air from a house's water supply is usually minor. Long term exposure to radon can lead to lung cancer. Some houses draw water from private wells or private water systems. The federal government has no authority over the quality of water in these private systems. The government's only authority in this area is to protect the source of the well water as much as possible. However, private landowners frequently, either intentionally or through negligence, pollute the ground on their property with pesticides, gasoline, chemical spills, or from faulty septic systems. 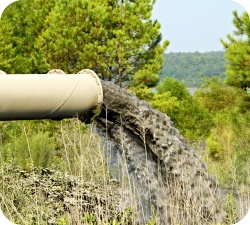 These contaminants can leach into the soil and enter the private well water supply. At a minimum, homeowners relying upon well water are well advised to test the water in their system once a year for coliform bacteria, nitrates, pH, and total dissolved solids. Testing for sulfates, chloride, iron, manganese, hardness, and the system's corrosion index should be done every three years.